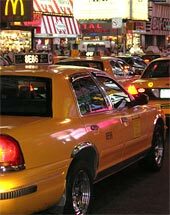 Getting around in New York - by foot, Bus, Taxi, Subway etc. New York City is a good walking city - it´s flat and much of the city is build as a grid system. You can also easily get around with buses, the subway or taxi. There are also ferries, helicopters and trains. As said... New York (Manhattan) is a walk friendly city. It is important to wear walk friendly shoes because when you have started to walk, you may end up walking the whole day before you are back at your hotel. It is a cheap way to see the city and you can really get a feeling of everything around you. You will feel the hectic city-pulse from the streets with all the people who are rushing past you in a high speed. Just go with the flow. Walking around goes also fairly quick. You will get even quicker than you think between the grid of streets and to all the sights. Gladly combine walking with the subway if you want to go longer stretches. 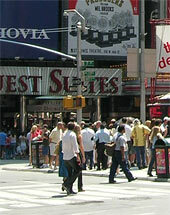 Good walking areas are: Times Square were it is close to Central Park and Radio City Music Hall to the north and Empire State Building to the south. Further down you have Lower Manhattan with Battery Park and the Wall Street Financial District. To take the subway is a quickly and a good way to move around. The subway is opened 24 hours. We have taken the subway late at night and it have worked out fine and it also felt okey. But, as in all big cities you shall be careful at night. The thing you can say about the subway is that it feels a bit confined and it can be really hot down there during the summer months. On board the trains it can instead be really cold with the windy aircondition. The routes are marked with the numbers (1 2 3 etc) and with letters (A B C etc) and with colours. If you need to change subway during your journey, don´t forget to see at which stations you are able to switch trains. One single trip costs $2.75 (2014) and the ticket you buy in a vending machine. You can also buy a Metrocard - see info under Bus. With a Metrocard a single ride tickets get a bit cheaper. You can also buy a Metrocard for a certain amount of days. 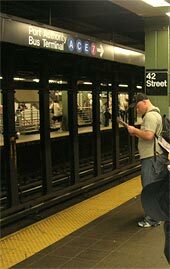 Subway Entrances: You often find the subways below a staircase on the streets and on crossroads, marked with a sign with a motif of a stair. Security: We remind you that when you are waiting for a train in the subway, do not stand too close to the edge. Accidents have occurred where people accidentally have been pushed down on the track. Stand at the walls when there is a crowd. There can also be a significant draft when the train is coming. If you want to go by Taxi you will have a few to choose from. All of Manhattan is "yellow" of all the taxis that are driving around in the town. You can stop a taxi directly at the street - you do this with a wave with your hand. The easiest way is if you can stop the taxi in your travel-direction. You can also find taxis at the big hotels. Free: A taxi is free if the white numbers on the rooftop sign, is lit. If the text "Off Duty" beside the numbers is lit the taxi will not stop (the car is not on duty). Meters: Taxis shall go on meter. The cost depends on how far you shall travel, how long time the trip takes and when you are travelling during the day. A taxi fare starts at $2.50. If you are passing a paytoll tunnel or bridge during your trip you also have to pay this. On top of the total fare is also a tip of 15%. There are many buses that can take you around the town. 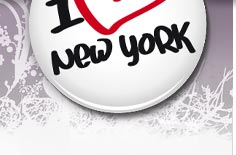 But if it´s a lot of traffic - that often is the situation in New York - the trip can take a while. Then we can recommend the subway instead. But with the bus you will at least get a nice sightseeing of the city that you will not get with the subway. Bus stops you will find all around, as in all towns. Exact change: A single fare costs $2.75 (2014). You board at the front of the bus and pay. If you do not have a buspass - MetroCard - you can pay with exact change in coins. The farebox do not accept bills or pennies and the busdriver do not leave any change back. 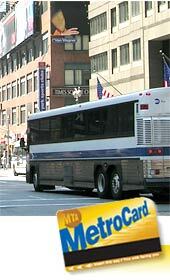 With the MetroCard you can jump between bus and subway during a time period of 2 hours. It will also be cheaper with a MetroCard - you can choose between different cards (as for example: 1 day, 7 days, 30 days or one were you choose the value from $4 and up). You can go by bus for FREE with The Downtown Connection® Bus. A downtown bus service that take you between the rivers from South Street Seaport and Battery Park City. A really nice service. You can hope on and off as often as you like at the stops on the way. 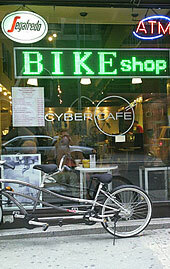 For those of you who want to see New York by the "wheel" there are many places in town were you can rent a bike. Be careful when you ride on the roads. Do not bicycle too close to parked cars (they can open the door and you fly off the bike). Ride like you do at home, you are part of the traffic. Of course it feels different to ride in New York than at home. Our suggestion is that you bicycle in Central Park where there is no traffic. Note: If you're biking in the evening, be sure to use reflectors! The helmet is a matter of course, both day and night. Some places want you to show up your passport. Tip: Book online when you're there, it can give you a good discount! New York have modified many of their transportation to be used by disabled persons. Subway: Sorry to say, not all subway stations are suitable for disabled persons. There are stations that have elevators and/or escalators. Service animals may be taken aboard. Subway maps have marks of subway stations that are modified for disabled persons. Bus: All buses that are run by - MTA/New York City Transit - have "kneeling" feature for wheelchairs, special seats for disabled persons onboard the buses, and security features for wheelchairs. Service animals may be taken aboard. Taxi: Shall accept customers with wheelchairs that can be folded and customers with service animals.